Rosie Birkett grew up in a family who lived to eat. Rosie was exposed to cooking by a talented mother who turned even the simplest ingredients into delectable delights. Now Rosie has taken that love of the edible and followed in her parents' journalistic footsteps to forge a successful career as a leading food writer and stylist. A Lot on her Plate is a culmination of Rosie's favourite recipes inspired by years as a food writer and hungry traveller, featuring over 80 fun and creative dishes that will appeal to a wide range of home cooks. Rosie's writing style is infectious and very readable, she starts by telling us How to Shop and encourages us to get to know our local suppliers, but there is an acknowledgement that not everyone is able to do this, at least not all the time. I loved the equipment flow chart from essential to less essential (but still really useful). Basic Ingredients are also outlined and kept pretty much to the sort of things that I would keep in my fridge, freezer and larder. Breakfast + Brunch: Elly's pea, feta and spring onion frittata is a simple but tasty dish easy to make in the morning. Guacamole Bread with fried eggs and chipotle salsa sounds and looks (in the photo) quite amazing, definitely a brunch dish worth making. I also liked the sound of Basted Eggs with Kale, lemon and chilli great flavours to wake up your tastebuds. Starters and small plates: Crab and Tarragon mezzaluna (little tarragon pasta parcels filled with crab), Leeks vinaigrette looks simple but delicious served with gorgonzola and walnuts, more 'chipotle love' with Winter Squash soup with chipotle, roasted garlic and crunchy seeds. 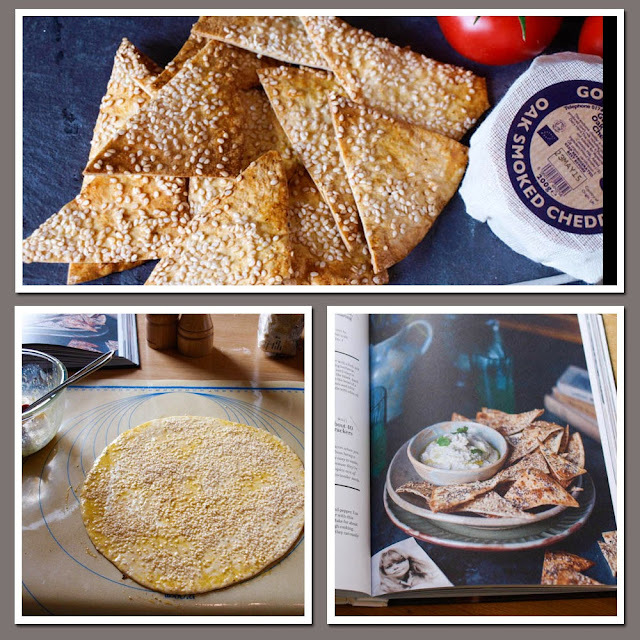 Snacks and Sides: Cheat's seeded crackers are such a clever idea (see below); Baby potato and rosemary pizzas; Marmite gougeres, love 'em or hate 'em and Chilli, garlic and sesame kale chips. Bigger Plates and Super Suppers: I love risotto so the Parsley, bacon and broad bean risotto will be a recipe on my plate. The Oxtail French dip sandwich looks amazing and is sure to be popular, another Risotto of Leek, Smoked Mackerel and toasted almonds, oh my goodness, I love the sound of that. I'm also drawn to Rosemary-fried mackerel fillets with buttered new potatoes, pickled samphire and radishes. Feasts for Friends: Rosie likes to feed her friends and I'm sure they are not disappointed with dishes like Chicken, mushroom and tarragon cassoulet, Maple-braised pigs' cheeks with apple, roasted hazelnuts and Parmesan polenta. I'm sensing a chipotle theme going on in the book, or is it just that I'm seeing them as chipotle chillies are my favourites? Anyway, Chipotle Roast Chicken sounds the business. Salads and Vegetables: I love figs so the Fig, rocket and Gorgonzola salad with toasted almonds and maple dressing appealed immediately. Surprisingly the Shredded sprout salad, two ways looks fabulous who knows it may convert some sprout haters. Summer watermelon, feta and radish salad with mint just screams summer at me, I hope we get some warm weather as I'd love to eat this outside with some grilled meats. Desserts and drinks: Combining just about every food trend going a Salted butterscotch popcorn cheesecake is a fun dessert for a party or a movie night in. For a creamy treat Black Cherry Brulee hits all the right spots and it's made with a mix of greek yogurt and cream, so a little lighter than a traditional brulee. Little Orange and Ginger madeleines would go well with coffee or a dessert wine, a nice combination of flavours. For a real showstopper, I would go for the Raspberry and white chocolate Jelly, set in a mould it has the wow factor. In the drinks department there is a homemade elderflower cordial recipe. Finally there is a chapter for 'Essentials' things that will take your dish to the next level. Preserved lemons are featured as are Chicken and Fish Stocks, some mayonnaise variations, salsa and Cumin Brioche. Beat the egg with the ground cumin, chilli flakes, and a little salt and pepper. Use a pastry brush to brush the spice egg wash over the tortillas. Scatter with chia seeds and za'atar, then cut each tortilla into triangles with scissors, Bake for about 10 minutes until crisp and golden, turning them over halfway through cooking. Keep a really close ye on them when you're baking them though, as they can easily burn because they're so thin. This is a genius recipe. The seeded crackers were crisp and tasty. I used slightly different spices and sesame seeds instead of chia and they were really good. Rosie suggests onion, poppy, fennel or coriander seeds. I think they are the perfect vehicle for all sorts of seeds and spices. 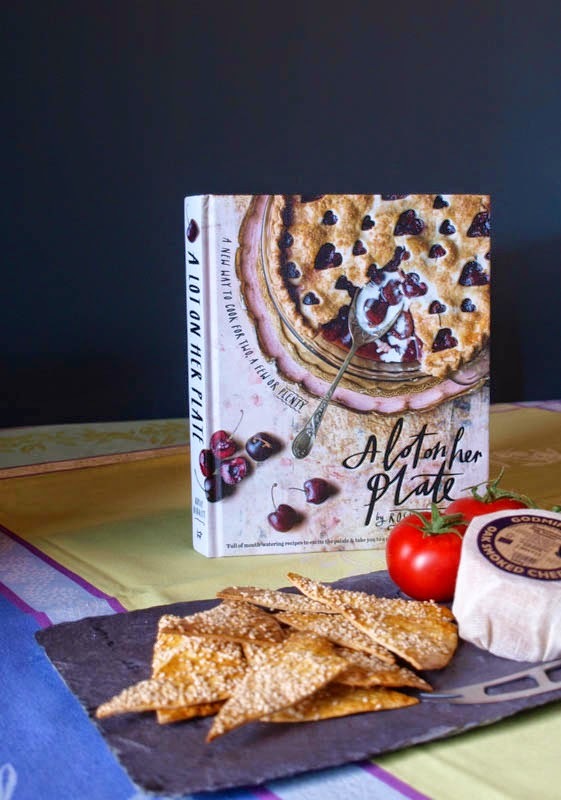 This is a book for real foodies, those who scour the high end food magazines for recipes featuring quality fresh ingredients used in interesting and different ways. Although there are many simple recipes, there are also some that I would struggle, either to find the ingredients for, or which would I would not attempt at home e.g. Octopus carpaccio. There are many interesting recipes using fresh ingredients and following many of the current trends lots of fish, kale, chia seeds etc. The photographs are good and there is a little introductory paragraph with each recipes giving background information and alternative suggestions. There are many very accessible recipes which would be great for entertaining. Many ingredients and techniques would be challenging to a beginning cook or someone who is looking for recipes for everyday cooking. An eclectic collection of very simple dishes that anyone can make with some more complex recipes using less common ingredients. It's a fun book and if the Cheat's Seeded Crackers are anything to go by, then well worth adding to your bookshelf. A great review here. Those crackers look great and I like how honest you've been with the review. I have a number of books that are full of great midweek meals and others that I use to inspire me for dinner parties and entertaining. I'll definitely be making these crackers. I love books that give practical and sensible tips and this one seems just that, love the photo there too! Thanks Sylvia, it is a lovely book. Thanks Angela, I try to write a balanced review. Thanks Manjiri, there are some good tips. Ooh these crackers look fabulous - i've always wondered about making my own and these look do-able! Love your book reviews Janice. I've never heard of Rosie before, but I like the sound of her book, even if it is a bit fish orientated for me. Those crackers sound fab. Absolutely love the concept of these cheats seeded crackers. Definitely going to try making my own variation of them.